The Sherpa, despite being a relatively small group, are one of the most well-known peoples of Asia. 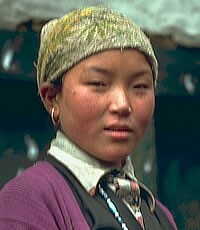 The Sherpa inhabit both sides of the Himalayan Range. The majority live in India, where more than 45,000 live primarily in the Darjeeling District of West Bengal and in the states of Sikkim and Arunachal Pradesh. More than 100,000 Sherpa live in Nepal, especially in the Solu Khumbu District and around the famous town of Namche Bazaar. An additional 10,000 live in Bhutan. In Tibet, the exact Sherpa population is uncertain. Various publications have listed 'a mere 400', '800 speakers in China' and 'no more than 1,000'. The Sherpa in Tibet inhabit parts of Dinggye, Tingri and Zhangmu counties. Tingri County is directly on the road from Kathmandu to Lhasa, a route frequented by many tour groups during the summer months. 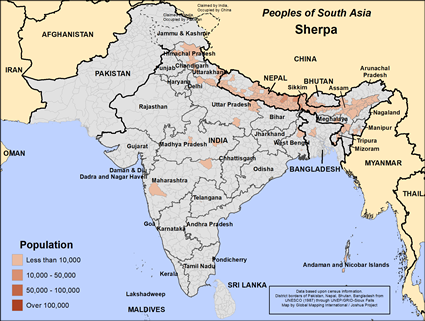 Small numbers of Sherpa have dispersed to South Korea and the USA in recent years. These numbers do not include the Helambu Sherpa, who speak a different language. The Helambu Sherpa have been profiled separately in this book. The name Sherpa means 'eastern people'. It is believed that all Sherpa once lived in Tibet before their descendants migrated west in the 15th century. 'At that time, a Mongol King attempted to force them to convert to his sect of Buddhism. The people fled to the Khumbu region.' A Chinese account states, 'They believe themselves to be descendants of Tibetans from the Kham region in Sichuan Province. Many, many years ago, their ancestors, returning from a pilgrimage to Buddhist temples in India and Nepal, settled down here.' The Sherpa are distinguishable from Tibetans 'in part because their faces are smaller and they wear a colourful apron on their backside rather than the front'. Because the Sherpa language is related to Tibetan, most can communicate in a simple form of Tibetan. Few of the 20,000 Sherpa in the Darjeeling area of India are still able to speak Sherpa. For many, the name Sherpa is inextricably linked to the mystique of Mount Everest, the highest mountain on earth. The first men to climb Mount Everest were New Zealander Sir Edmund Hillary and Sherpa Tenzing Norgay in 1953. Numerous Sherpa guides have since led foreign climbing teams up the world's highest peak. The Sherpa are Tibetan Buddhists, although 'with far less piety than the Tibetans. To have a Buddhist statue and to recite or chant scriptures is all they do by way of religious practice.' The Gyawa festival takes place 49 days after the death of a loved one. The Sherpa eat as much food as they can during the festival, believing that the food will nourish the loved one who has died. In 1985, a Sherpa boy in Nepal had a vision in which Jesus visited him. The boy's conversion was followed by the gradual conversion of his extended family and several families in his village. The boy later went to Bible school and returned to pastor the local church in his village. There are reported to be at least a few dozen Christian Sherpas around the Mt Everest region in Nepal. View Sherpa in all countries.